The Trek Collective: 8472 online! 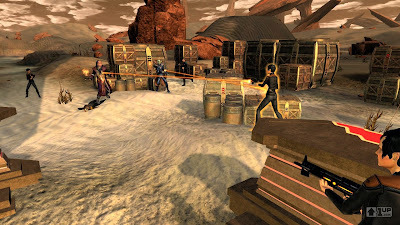 1up.com have posted an interview with Star Trek Online's executive producer Craig Zinkievich. 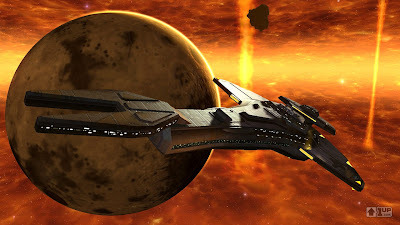 They talk about a few features of the game; a bit about how tactical the starship combat will be; the possibility of becoming an admiral; and a hint at the games story opening with the Klingon conflict the Path to 2409 timeline has been building up to. But far more exciting than all that talking around the subject, new pictures! Including an armoured Species 8472 under attack by Cardassians! 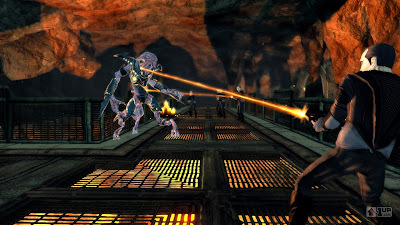 There's also what looks a lot like a Reman fighting alongside a Klingon. And a good old Galor class flying about in the badlands.